Scotland’s leading supplier of animal feeds and animal health products, Harbro Ltd, is poised to win a larger share of the market in the southern half of Scotland – south of the M8 Glasgow-Edinburgh motorway – following a bold investment in a new feed mill in Lanarkshire and an audacious move which has considerably strengthened the company’s presence in the area. The final piece of the jigsaw is now in place for Harbro to roll out the company’s strategic plan to increase its share of the market in the south of Scotland to the same level it has long enjoyed in the area north of the M8. Harbro is already the biggest supplier of animal feeds to Scottish farmers, with annual sales of 250,000 tonnes of compound, blended and straight feeds, and also animal health products, largely through the company’s network of 12 retail outlets. “Our existing customers for feed include six of the top 10 yielding dairy herds in Scotland which demonstrates the high quality of our products and the technical back-up we provide to our customers,” says managing director, Graham Baxter. The new state-of-the-art mill, conveniently situated on a 10-acre greenfield site within the new Birkhill Commercial Park just off the main M74 Glasgow-Carlisle motorway at Lesmahagow, represents an investment of £5 million and has been designed to human food standards. Features include stainless steel storage bins for raw materials to improve hygiene and accuracy of formulation compared with the on-floor storage found in most blending plants. Two storage and distribution warehouses cover an area of 75,000 sq ft. The mill will have a capacity of 30,000 tonnes of blended feeds and the same tonnage of compounds. The development has created 15 new jobs. 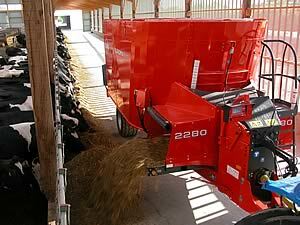 Feed blending will shortly transfer to Birkhill and compound feed production is due to start in the spring. The complex is also home to subsidiary company, Strathclyde Nutrition Ltd, which manufactures a range of molassed licks and feed blocks for both the wholesale and retail market. The new mill was officially opened earlier this year by HRH the Princess Royal who was conducted on an extensive tour of the plant before unveiling a plaque to commemorate her visit. Mr Baxter said farmers appreciated the investment being made by Harbro in supporting Scottish livestock farmers at a time when other companies were closing plants. Harbro has also recruited seven additional technical sales specialists, including regional sales manager, Neil Kidd, to augment the existing sales team in the area, and drive the company’s plans forward. The sales force on the ground is supported by a highly qualified team of technical specialists, including Angus Kerr, son of a Dumfries-shire farmer, who has moved from Turriff to Birkhill and will provide farmers with on-farm technical advice and feed formulation support. Farmers were given the opportunity of viewing the new plant last Thursday (December 7) following an open forum addressed by milk quota broker, Ian Potter, and ANM Group Ltd chief executive, Brian Pack.